Unlike the rest of the Lincoln-Hanks clan, John Hanks became a Republican and served in the Union Army. His loyalty to Mr. Lincoln never wavered. John Hanks played a central role in three events in his cousin’s life. The first was the family’s move from Indiana to Illinois in March 1830. Hanks, who lived near the Lincolns in Indiana, had moved near to Decatur, Illinois two years earlier. John returned to Indiana and his praise of the area induced Thomas Lincoln, Dennis Hanks and Squire Hall all to move west. 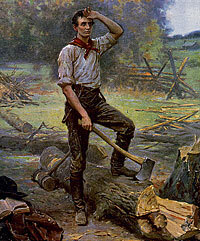 Lincoln biographer William E. Barton wrote: “About March 1, 1831, just a year after his entrance into Illinois, Abraham Lincoln and John Hanks launched their canoe into the swollen water of the Sangamon and were floated by the melting flood of the deep snow to Judy’s Ferry. About the middle of April they launched their flat-boat. John Hanks did not accompany the boat all the way to New Orleans. By the time they reached St. Louis his concern for his family caused him to leave the party, and he walked back to Decatur.” That did not prevent Hanks from later claiming to have witnessed what Lincoln did and said in New Orleans. Attorney Henry C. Whitney confirmed that John Hanks “came to Washington in a new suit of blue jeans – wanted an Indian agency.” President Lincoln “really wanted him to have it but he couldnt read or write.”15 Dennis Hanks confirmed that John Hanks said Mr. Lincoln said he would have received the appointment had he only known how to read and write.16 Whitney said Mr. Lincoln thought perhaps that “Hank’s son could be his clerk” but ultimately declined to make the appointment.17 John Hanks instead joined the Union Army and served as a teamster in an Illinois regiment. William H. Herndon and Jesse W. Weik, Herndon’s Life of Abraham Lincoln, p. 60-61. William H. Herndon and Jesse W. Weik, Herndon’s Life of Abraham Lincoln, p. 61. William H. Herndon and Jesse W. Weik, Herndon’s Life of Abraham Lincoln, p. 62-63. Isaac N. Arnold, The Life of Abraham Lincoln, p. 162. William O. Stoddard, Abraham Lincoln: The Man and the War President, p. 177. Rufus Rockwell Wilson, editor, Lincoln Among His Friends: A Sheaf of Intimate Memories, p. 193 (Richard J. Oglesby, Century Magazine, June 1900). Michael Burlingame, editor, Noah Brooks, Lincoln Observed: The Civil War Dispatches of Noah Brooks, p. 214 (from Noah Brooks, “Personal Recollections of Abraham Lincoln” first published in The Harper’s Monthly Magazine, May 1865). Mark A. Plummer, Richard J. Oglesby, Lincoln’s Rail-Splitter, p. 45-46. Mark A. Plummer, Richard J. Oglesby, Lincoln’s Rail-Splitter, p. 46. Abraham Lincoln Papers at the Library of Congress. Transcribed and Annotated by the Lincoln Studies Center, Knox College. Galesburg, Illinois. (Letter from Richard J. Oglesby to Abraham Lincoln, February 17, 1861). Douglas L. Wilson and Rodney O. Davis, editor, Herndon’s Informants, p. 632 (Letter from Henry C. Whitney to William H. Herndon, August 27, 1887). Douglas L. Wilson and Rodney O. Davis, editor, Herndon’s Informants, (Letter of Dennis F. Hanks to William H. Herndon, January 26, 1866). Allen C. Guelzo, “Holland’s Informants: The Construction of Josiah Holland’s ‘Life of Abraham Lincoln,’”, Journal of the Abraham Lincoln Association, Volume 23, Number 1, Winter 2002, p. 12. Rufus Rockwell Wilson, editor, Intimate Memories of Lincoln, p. 239-240 (Richard Price Morgan, February 12, 1909). Rufus Rockwell Wilson, editor, Lincoln Among His Friends: A Sheaf of Intimate Memories, p. 194 (Richard J. Oglesby, Century Magazine, June 1900).